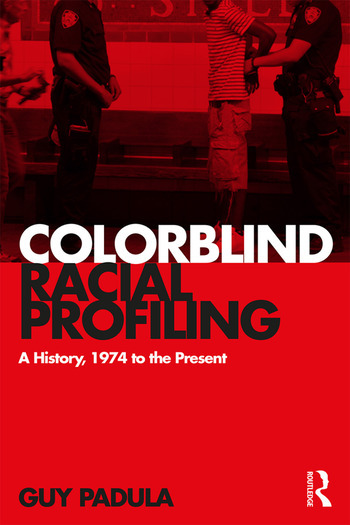 Colorblind Racial Profiling outlines the history of racial profiling practices and policies in the United States from 1974 to the present day. Drawing on a wide variety of sources including case law, newspaper and television reporting, government reports, and police manuals, author Guy Padula traces how institutionalized racial profiling spread across the nation and analyzes how the United States Supreme Court sanctioned the practice. Insightful and accessible, Colorblind Racial Profiling is essential reading for all those interested in the history of racial profiling and criminal justice in the United States. Guy Padula is Assistant Professor of Law at Renmin University in Beijing, China, an Adjunct Professor in Temple University’s Beasley School of Law, USA, Beijing Master of Laws LL.M. Program, and the author of Madison v. Marshall: Popular Sovereignty, Natural Law and the United States Constitution.